The world is rapidly moving towards building a cashless economy and rapidly adopting credit cards, debit cards and online transactions to minimize the physical cash transaction. Secure payment systems helps in the development of world economy, thus all countries are encouraging the adoption of convenient, secure and affordable payment systems. Countries such as Singapore, the Netherlands, France, Sweden and Canada are among the top countries with cashless transactions. Whereas developing countries such as China and India have only 10% and 2% cashless transactions respectively. However, government steps towards cash less society is expected to bring positive opportunities for point of sale (POS) terminals market. In 2016, cashless transaction volume grew by nearly 11% to reach over USD 430 billion. Encouragement towards digital and enhanced payment systems with better security measures are propelling the growth of non-cash transaction and thereby resulting in the demand for POS terminals. Over 20 billion credit cards, debit cards and prepaid cards worldwide are present in 2016 which is expected to reach over 26 billion during the forecast period. Booming retail and hospitality sector is supporting the ongoing demand for POS terminals market. Moreover, rising inclination of users towards Software-as-a-Service based systems and Android POS systems are also supporting the growth of global POS (point of sale) terminals market. Global POS (point of sale) terminals market is estimated to reach over USD 131.5 billion by the end of 2024 and is anticipated to grow at a CAGR of 14% during the forecast period. Expansion of e-commerce business, rising concerns over eliminating the black money markets and favorable monetary policies are accelerating the growth of POS (point of sale) terminals market. 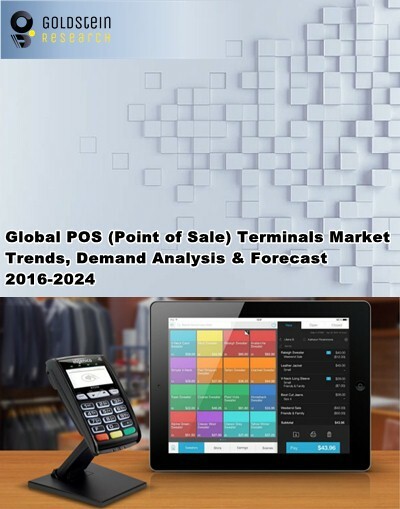 Europe and North America regions are the mature market for POS terminal owing to the strict government regulations and presence of leading market players in the region. In 2015, European countries such as Germany, France and Spain introduced laws which limit cash transactions. In France, usage of cash over USD 1080 is now an illegal act in the country. Developing countries such as Brazil, China and India are growing at a faster rate in the implementation of POS terminals within the country. Inclination towards digital payment method over the hard currency transaction with expanding online sales business is contributing in the adoption of POS terminals by every industry verticals. Implementation of near-field communication (NFC) technology for contactless transactions and popularity of EMV (Europay, MasterCard, and Visa) are also driving the growth of POS terminals market. POS terminals help in eliminating the transportation and security cost of cash management and also reduces the corrupt practices in the country. These factors are fuelling the POS terminals market growth. However, lack of availability of infrastructure, proper internet connectivity, access and awareness of technology majorly in developing countries inhibiting the growth of POS terminals market. Privacy and security concerns related with the tracking of payment transactions are restricting the adoption of non-cash transaction by users.